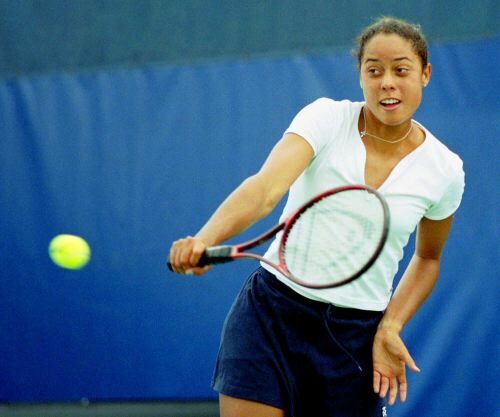 Although many in the modern game of tennis use the two-handed backhand, there are many of you who prefer to hit the one-handed backhand, exclusively. There are some good reasons for using this one-handed backhand.� First, you have increased reach in comparison to the two-handed version.� Second, it is easy to switch from a driving backhand (one that is hit flat or with topspin) to the slice variety.� Finally, I think that those who hit the one-handed backhand are normally better volleyers. Why? Well, I think because of the brain similar �software� and grips. Certainly, Pete Sampras believed this to be true when he switched from a two-handed to one-handed backhand in his teens. 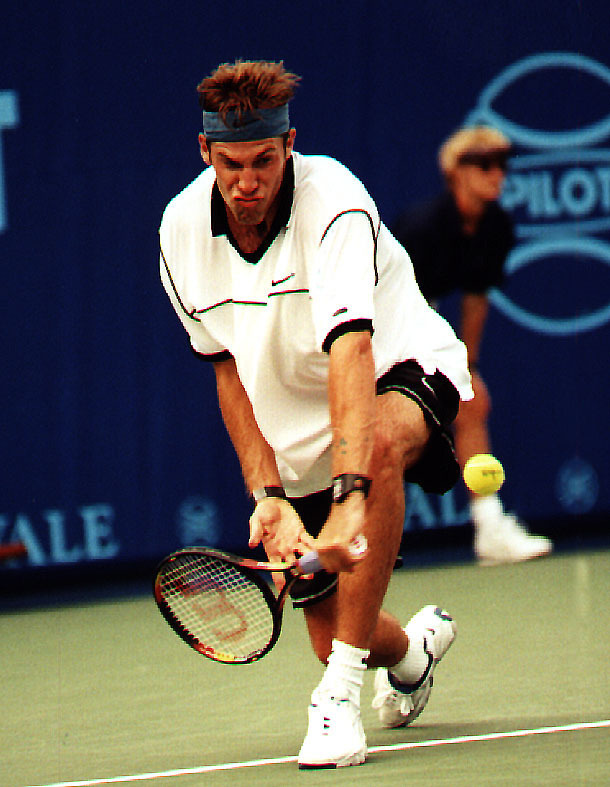 The downsides to the one-handed drive exist, but shouldn�t discourage anyone from adopting this stroke.� The one-handed drive requires a bit more strength to hit with pace in comparison to the two-handed version.� The timing on one-handed backhands is a bit more critical and a little less forgiving.� Finally, one is a bit more limited in terms of what stances can be used effectively when hitting the one-hander. 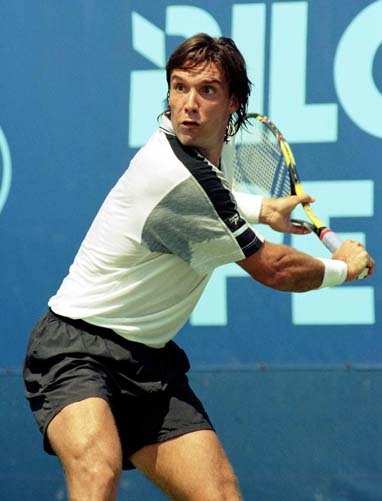 Having said this, I am dedicating April�s column to the one-handed, backhand drive.� Again, by a �drive,� I mean those one handed backhands that are hit flat with pace, or with topspin.� The sliced backhand is a very different stroke. As always, let�s begin with a discussion of grip.� There are only two grips that I recommend for hitting the one-handed drive:� the eastern backhand and the severe (sometimes referred to as western) eastern backhand. 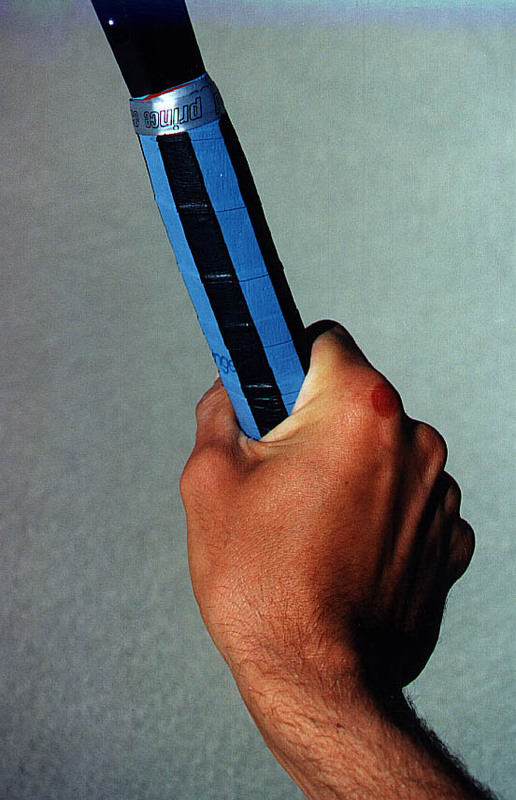 Now, one can hit a flat drive using the continental (the preferred grip for the sliced backhand), but hitting topspin with a continental grip is to say the least difficult.� Why? 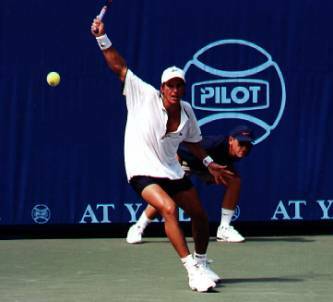 To hit a one-handed drive, you need to get your palm �behind� the ball.� The continental grip puts the palm more on top of the racquet handle than is desirable. 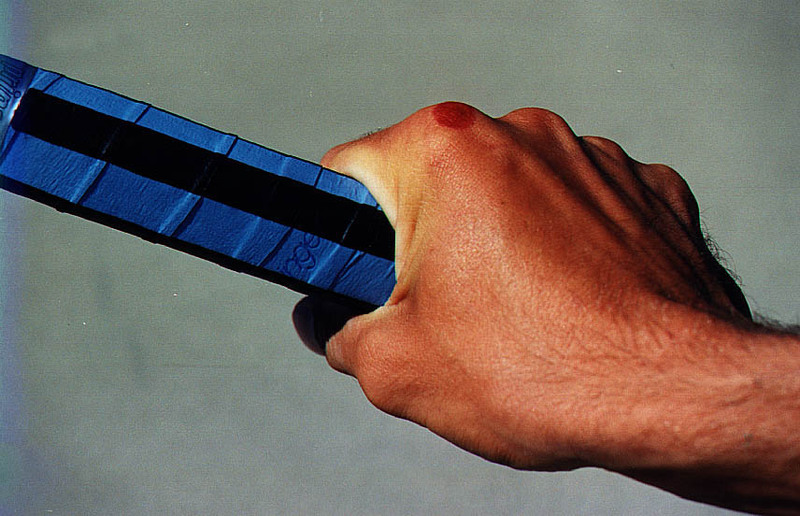 Here is a picture of the eastern backhand grip.� Don�t forget to click on these images to enlarge them. Please note that the black areas represent the handle�s bevels and the blue areas represent the top, sides and bottom of the handle. 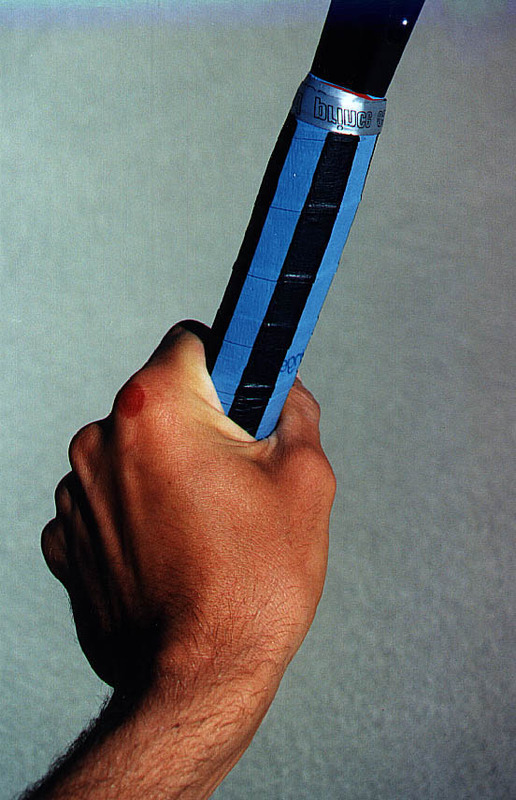 These two grips illustrate how to hold the racquet for the extreme eastern backhand grip (sometimes referred to as the western backhand grip). 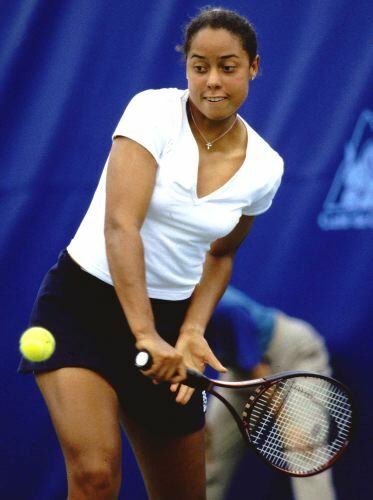 To further help you lock onto these grips, let�s take a look at a few images of pros who hit the one handed, backhand drive.� Here, we see Alexandra Stevenson using the eastern backhand grip. In the following picture, we see Gustavo Kuerten setting up using the severe eastern or western backhand grip. The one-handed, backhand drive is normally hit with a closed stance. One needs to get her/his body sideways to the net when hitting these strokes. 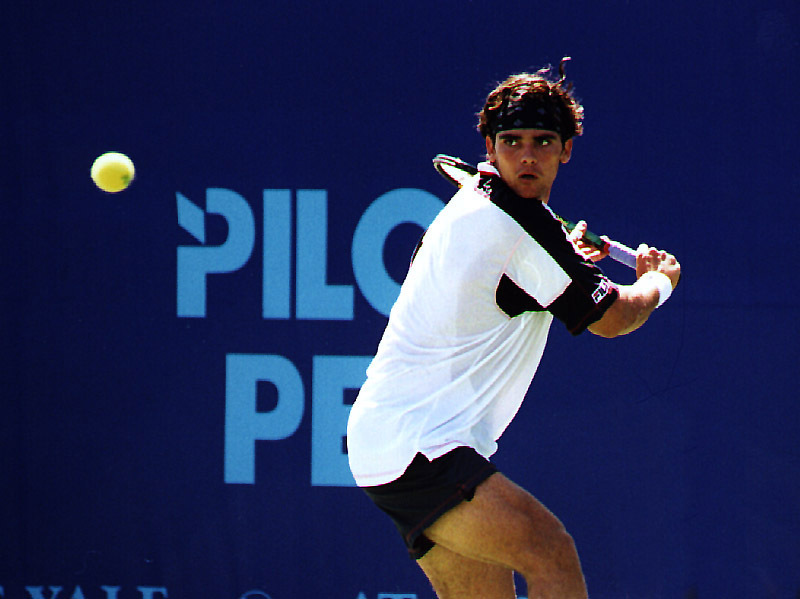 In the photo below, we see the South American pro, Hernan Gumy, using a sideways stance to hit what will be a one handed backhand drive. Given the position of his racquet (up around shoulder height), he is likely to be hitting a hard, flat backhand drive. Here, we see Alberto Costa as he gets into position to hit the backhand drive. Although it appears that he will hit using an open stance (in truth he is fairly sideways to the net), in fact, he will lean forward and transfer his weight to his right foot when he makes contact with the ball. You can see that setting up properly for the one-handed backhand drive requires some critical timing�especially when you are on the run. 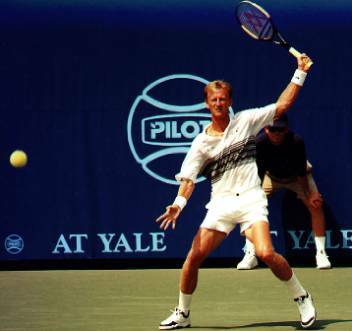 Still, if needed, a player can hit a one handed drive from an open position.� Here, we see Petr Korda finishing his one-handed drive.� Note that his stance is very wide open.� I remember when I took this shot.� I was amazed that he could get such pace when using this open stance.� One-handed, topspin drives hit from open or semi-open stances require some serious arm strength and/or perfect timing.� Petr�s timing, when he was active on the tour, was phenomenal.� However, when hitting topspin, it does become a little easier to hit the one-handed shot from an open stance. 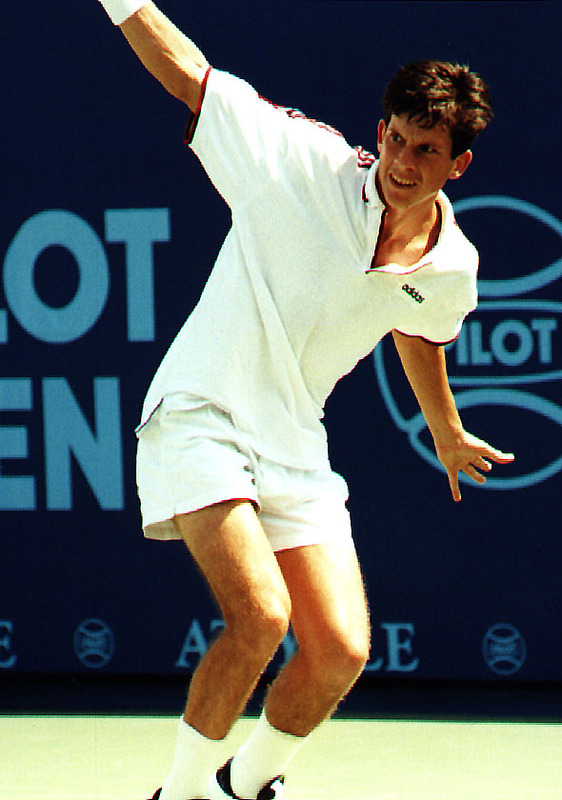 In my previous articles dealing with groundstrokes, I have deliberately avoided any discussion of contact points.� Why?� Well, it has been my experience that players have some �play� in terms of contact points when hitting modern forehands, two handed backhands, and even to some degree, one-handed slice shots. I would rather see players focus upon shorter backswings and full finishes (too many things to think about cloud the mind). However, with the one-handed, backhand drive, you must hit the ball in front of your body and you must use a full backswing. 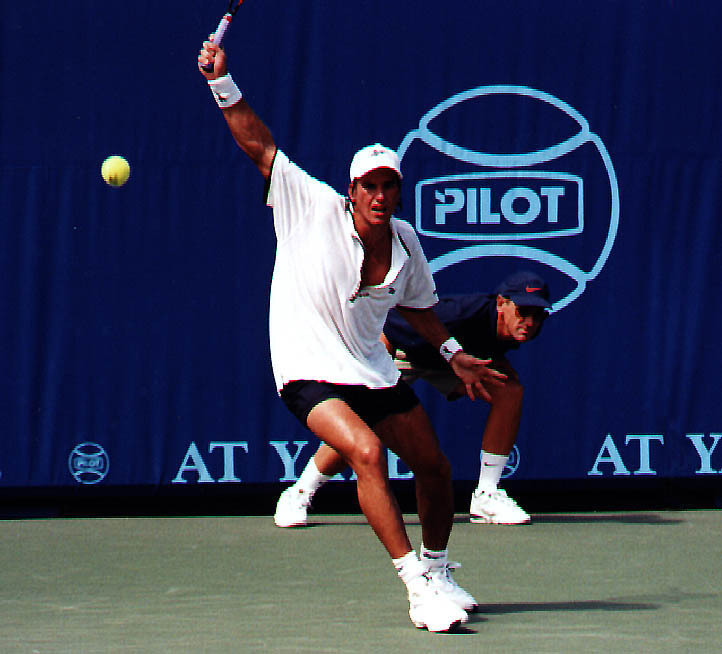 In each of these two shots, the player will make contact at a point that is about 2 to 3 inches in front of her body.� By varying the position of this contact point, one can direct the ball crosscourt, or straight-ahead.� Hitting an �inside out,� one handed backhand is difficult to execute and control.� Generally, one wants to have the body weight going forward when hitting the one-handed backhand drive. However, on very high bouncing balls (as would be seen at on clay surfaces like those at Roland Garros), be prepared to hit the ball off the back foot with the weight going backward. Again, these are likely to be topspin drives. Thomas Muster was a master at hitting off the back foot. 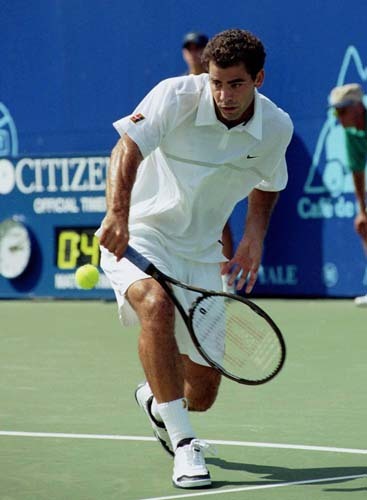 I suspect that Pete Sampras has difficulty on clay, in part, because he is not as comfortable hitting a backhand with his weight going backward. 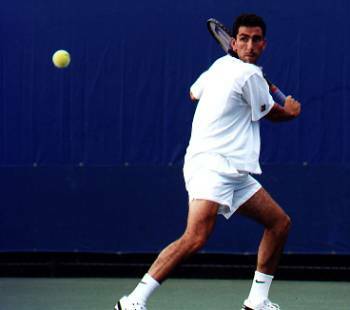 If you are attempting to hit with topspin, you will definitely need to get �under� the ball.� However, flatter shots require some �lift� as well�but, not as much as the topspin drive.� Look at how low Pete Sampras and Greg Rusedski get low in order to be able to get �under� and lift the ball. 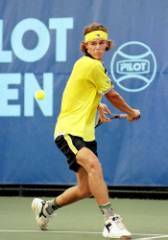 If you read my column regularly, you know how much importance I place on finishing the stroke properly.� It is my firm belief that, when it comes to groundstrokes, the finish is extremely critical. The one-handed backhand drive is no exception. To finish this stroke properly, you need to finish with the racquet forward and high�much higher than one would finish if hitting the one-handed slice. Let�s take a look at some great finishes. Setup (racquet back, body in position) as early as is possible. Try to use more closed stances whenever possible. Use an eastern backhand grip for flat drives, use the severe eastern backhand grip for topspin drives. 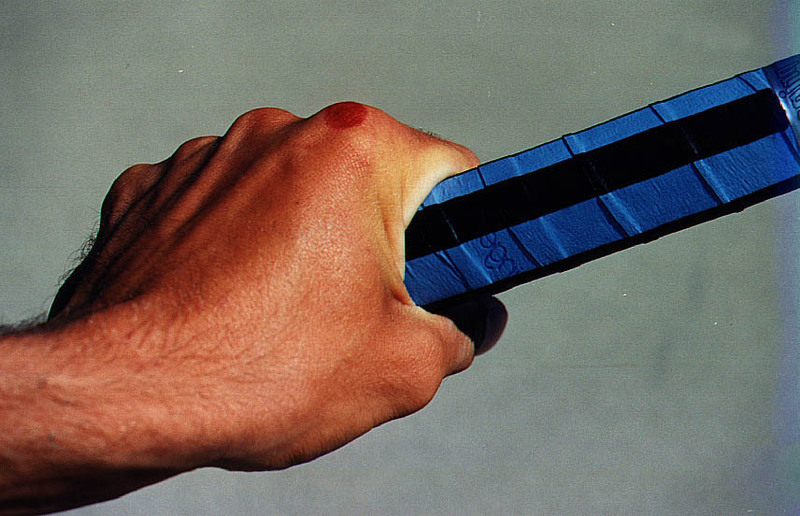 If you are only going to use one grip, I suggest the severe eastern backhand grip. Make certain to make contact with the ball in front of your body. Finish with the racquet moving forward and upward.� I suggest that you try to �push� the ball forward at the moment of contact, and then, lift the racquet up�finishing over your head.� Don�t forget that if you are hitting topspin, you must �lift� the ball. With the severe eastern backhand grip, you may be able to use a little wrist action to help you impart topspin. The one-handed, backhand drive is one of the most beautiful and deadly shots in tennis.� Don�t be deceived into thinking that it cannot be hit with pace!� Just watch Mark Philippoussis as he strikes his one handed drives shot�they go off like a cannon! I promise you that, should you adopt the above guidelines and practice this shot, in no time, you will become a tennis overdog.